This was going to be my post for Wine Blogging Wednesday. But I was so addicted to the aroma, taste and process of Waters Crest Night Watch, that I just had to post that wine first. This Merlot was so god that it needed a post all to itself. Waters Crest wines are handcrafted by one time home winemaker Jim Waters. He is very careful as to what fruit is put into his wine. And there is a lot of good fruit in this wine. On the nose I was getting loads of Raspberry, and Cherry notes. There was a subtle dusting of coca there too. In the glass I was getting some juicy blackberries, and black cherries. There was also some white pepper and some smooth spices, some cardamom and coriander. There was just a kiss of woodsy cedar. This was all aromatic and fruit forward. The tannins were subtle and the acidity was just right. This is such an easy drinking wine that is both affordable ($21.99) and approachable. There were only 144 cases produced of this fine merlot. I also revisited the wine 2 days after opening the bottle. And it was still going strong. I was getting the most fantastic chocolate covered cherry aroma that I just wanted to sniff for hours. And it carried over in the taste. Truly amazing. Please, please pick up this wine. It was one of my favorites from the 2006 vintages on Long Island. My wife and I enjoyed this wine. You and yours will too. 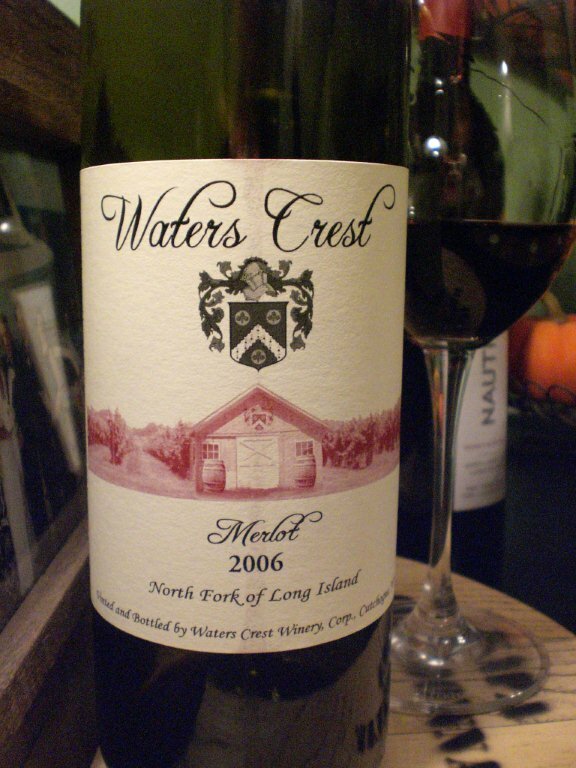 This entry was posted in Long Island, Merlot, Notes, Waters Crest Winery, Winery Visit. Bookmark the permalink.